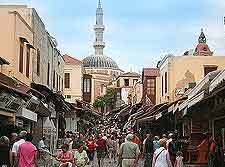 After you have spent time on the beaches of Rhodes and eaten at the island's Greek tavernas, you may wish to explore the shopping scene and purchase some holiday memories. 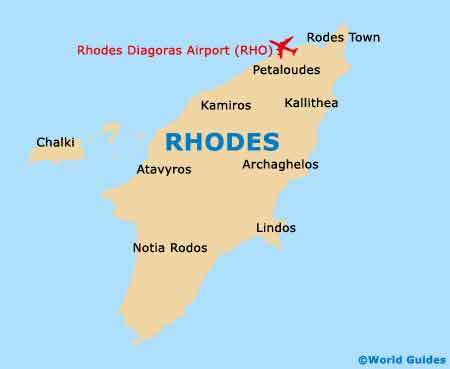 Rhodes is well known in Greece for its gold and silver jewellery, local honey and quality leather goods. If you are shopping for souvenirs of your time on the island, you may also like to consider the ceramics available at the 'Keramik' factory outlets, brightly coloured sea shells, and of course, a bottle of two or authentic Greek olive oil and maybe even a Rhodian wine. There are plenty of gift shops distributed around the main beach resorts on Rhodes, although many of these are a tacky and may sell unlicenced or fake brands, which are often very cheap. 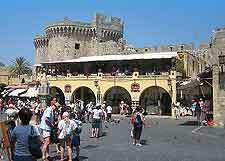 Rhodes Town is understandably the best place on the island for shopping and many of its most popular stores lie within the Old Town and the paved alleys. Many leather goods sold in the town are not actually produced on the island, and are instead imported from Northern Greece, or even Turkey. Shoes are always a popular buy in Rhodes Town, with unusual styles catching many a tourists' eye when simply window shopping. Around the island, hand-woven embroideries are sold, often from monasteries or gift shops not only around Rhodes Town, but also in various villages, such as those of Afandou, Archangelos and Lindos. 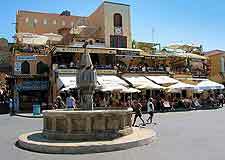 Whilst Lindos is very much second to the island's capital, it does contain a very good selection of shops, including a number of supermarkets and jewellers.